HER Journey, HER Story She saw it, she believed it, she fed it, she manifested it! “We are SO GLAD we hired Angela, my husband & I love her dearly & call her an angel! I seriously tear up thinking about how she walked with me through the pregnancy & birth as a voice from God. She was in my ear telling me everything I needed to hear, especially the day my son arrived! I was worried about having a hospital birth, that it would be too medicalized, and had other people’s negative stories in my head, I had to learn to let that go & live my own story! 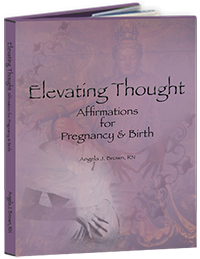 Angela assured me that I could have a beautiful birth experience there – and she was right, I did! Also my husband wanted to hire her within 5 minutes of meeting her, she’s a captivating woman with so much knowledge & experience! Her Pregnancy Life Coaching helped me grow so much as an empowered woman. Those sessions alone brought huge shifts in how I use my mind in every moment to live from a place of love & empowerment. I connected more with my baby, talking to him & trusting this beautiful journey that was meant for us! I make decisions out of love, not fear, I trust myself. I used to ruminate on worries about the past or future, I had a lot of anxiety. Now, I am present & more capable of loving all that God puts in my life. Pregnancy helped me to do that, but she helped clear the path in my mind so many times when it became cluttered with unnecessary worry. Worrying is a habit that CAN be broken! I jumped some major mental hurdles & can’t believe how lucky I am to have that as part of my pregnancy journey! I am deeply grateful & will be a better mother & human because of it! Angela really helped me to align my consciousness with my beliefs & true desires. Doulas have soooo much respect from me! Women DESERVE that support! My husband needed that support too in order to show up for me in the most supportive way possible. Soon-to-be-Dads, trust me, you’re gonna be happy to have Angela supporting you both! The whole day, (15 hours) she was right there with us, helping us both to find our confidence & faith! She came to our home then we all went to the hospital when I was ready. She reminded us that we were safe & it was all natural! We were a perfect team & I trusted them to support me in any way I needed. The nurses are very nice but very busy with all they need to do, they can’t support you the way a doula does. I feel like I got everything I asked for from the universe, and learned so much along the way! The birth & birthing time was AMAZING. It didn’t hurt, it really is just pressure even with no pain medication at all. Hypnobabies made me calm & focused, I was so in my body & the experience all day. Anytime I wavered from this state & didn’t know what to do to help myself, Angela was there to refocus & encourage me. The nurses could not believe when I was 9.5 cm & looked like I was sleeping! All day I was breathing my baby down, relaxing my muscles & letting my body do its work that it knew exactly how to do. It was a long day, a marathon, the most physical experience of my life & I’m so grateful I got to have that experience! Angela guided me to try different positions & movements to help the baby move down & help me find comfort. Her many years of experience are obvious & hugely beneficial to her clients. Feeling my son come out of me was the most unforgettable moment of my life!! 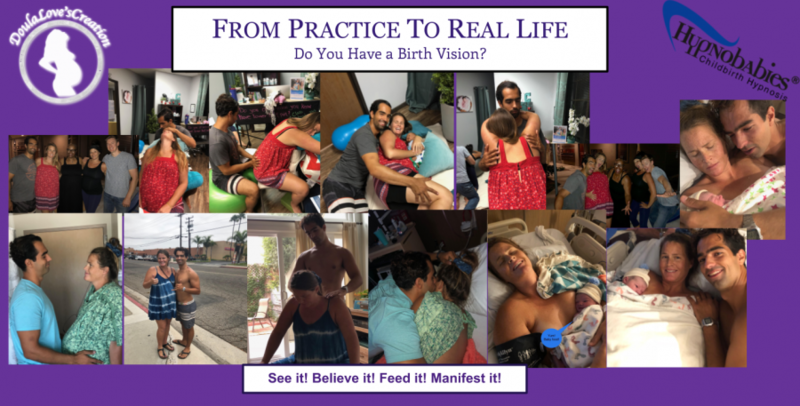 Here is a collage of client’s journey from Hypnobabies classes, birth rehearsal to Real Life. Natural birth at its best! 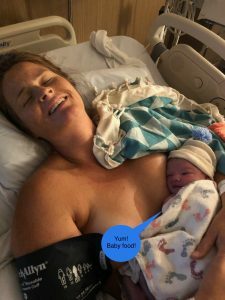 This kind of birth is possible for YOU as well.